In October 2016, Shailene Woodley was not paying much attention to work emails. The devoted environmentalist had gone to protest the Dakota Access Pipeline and gotten arrested in the process. It's no wonder that the actress missed an email from a few old Hawaii friends with a project based on the incredible survival at sea story of a 23-year-old woman in 1983. It's not that she wasn't interested — she was just a little busy. It would take about a month for the script to get into Woodley's hands, and she remembers being at her mother's house and just sobbing while reading about the story of Tami Oldham and Richard Sharp, a young couple who endeavored to sail from Tahiti to San Diego and endured a hurricane that nearly destroyed the ship and put it irrevocably off-course. The film based on their story, "Adrift," hits theaters Friday. "I called my friends immediately and I was like, 'Whatever I have to do to do this movie, please, please let me be part of it,'" Woodley said recently. It was exactly the kind of project the then-24-year-old was looking for. It was about love, survival, working with nature, and, under the ambitious direction of the Icelandic filmmaker Baltasar Kormakur, would become one of her wildest movie-making experiences. Kormakur insisted that they shoot on the open ocean off the coast of Fiji, much to the very strong and very understandable objections from the studio and financiers. But it was non-negotiable for the director, who's a lifelong sailor. "The first day of shooting on water it was sunny and like, 'Oh it's the best day ever,' taking selfies, 'I can't believe people pay us for this.' And I go, 'This is not the movie we're making,'" Kormakur said. "But cut to two hours later we're carrying buckets of puke. I thought, 'This is the movie we're making! Now we're talking! Roll the camera!'" For Kormakur, who also directed the film "Everest," shooting in real locations lends an invaluable authenticity to the final product, and he had cinematographer Robert Richardson ("The Aviator"), a three-time Oscar winner, behind the camera to help. "I strongly believe in this: People come and watch a movie and pay money for it and they want to be taken through something. They want to experience something and they experience through it the experience of the actor," Kormakur said. "And if you create reality from nothing there's often a feeling that it's a game." And on "Adrift," everyone was keenly aware that this was not a game, or even just a story, but the real life experience of a woman, now Tami Oldham Ashcraft, who survived something few can fathom. She wrote a memoir soon after her experience and says that the film "Adrift" is something she's been awaiting for 34 years. There had been a lot of promises over the years, and a lot of potential "Tamis" along the way, including Jodie Foster and Kate Hudson, but no movie until screenwriter brothers Aaron and Jordan Kandell approached her about six years ago and — much to her surprise — things actually started happening. Woodley boarded to play Tami ("she's a West Coast girl," said Ashcraft, "I just feel her vibe") and Sam Claflin as Richard, whose casting Ashcraft said is "uncanny... from his accent to his playfulness to his humor." Kormakur agreed that Woodley had that kind of "free spirit, nature loving" energy that is difficult to fake, but also praised her emotional truthfulness. "There is something authentic about when she goes to a place," he said. "She doesn't fake it in a soapy way, the kind of soap acting you sometimes see in American acting style." For Woodley, it's even simpler. "Truth is my jam," she said. "It would be impossible to not be authentic given the circumstances." Plus, she had both Ashcraft's memoir and the woman herself for any questions, big and small, and a subject that she felt strongly connected to. 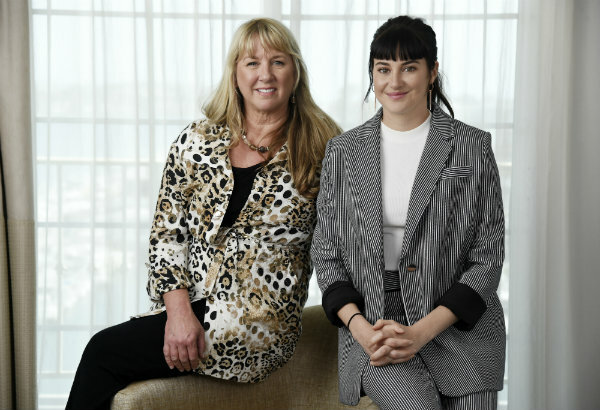 "The beautiful thing about this movie to me is that it is a woman's survival story but it's not a man or woman versus nature story," Woodley said. "It's a woman learning how to work with nature to survive." Indeed, Woodley's passion for the project ran so deep and she found herself doing so much, she eventually even got her own producer credit. "It became more than me fighting for my character as an actor, it was about fighting for the integrity of the whole project from start to finish," Woodley said. "It was a once in a lifetime opportunity. It's something that as hard as I try to articulate the experience I will never be able to fully encapsulate the emotion and the feelings that we had while we were out there. There's just something that happens when you spend that much time with Mother Nature." Review: Director Baltasar Kormakur's "Adrift"
Woman vs. nature. It certainly has a ring to it, especially when woman wins. But there are too few such stories in our popular culture, and certainly on our movie screens.